We decided to work with the two Alice stories and the life of Lewis Carroll for all its rich psychological terrain as well as its amazing structural components — but also because there is already a cultural cachet to these works which provides a really palpable entry point for audiences. Most folks are familiar with the stories to some extent, whether it's certain images or story lines that they remember from the books, film versions, or general cultural saturation. It gives us an opportunity to really take these images and themes into more abstract territory. This is a very good thing for immersive storytelling, where the narrative is inherently fragmented. Giving audiences something familiar allows them to enter the world with some sort of grounding, and then also allows us to quickly subvert those expectations . . . much like the Alice stories themselves. 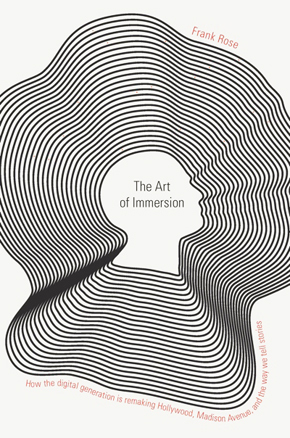 What makes an experience immersive? Clearly it doesn't have to depend on technology. It's immersive because when you enter it, the world engulfs you and you no longer see its edges. You are implicated as opposed to removed. There is no fourth wall at all in our experience, though sometimes you view scenes through carefully composed apertures, which gives you the feeling of being inside of a film. You are at times completely surrounded or directly engaged with the performers, and also in our case, engaged with the tastes, smells and textures that we provide. Immersive theater can exist anywhere on the spectrum in terms of the way it deals with audience participation, audience agency, or how the fourth wall is dealt with. In Then She Fell, we chose to meticulously guide our audiences through the world, so each performance/audience experience is carefully crafted for each individual. Forbes called this "theater for the video game generation." Is that something you set out to do? We certainly approached the creation of the work with the user experience in mind . . . ideas about agency, leveling up, game structure. Video game logic certainly played a part in informing certain structural choices. Rebekah Morin as the Red Queen and Tom Pearson as the White Rabbit in "Then She Fell." There've been a number of successful productions recently that seek to involve the audience more or less directly—Sleep No More, Secret Cinema in London (and soon in New York), Then She Fell. . . . Why do you think that is? I think the success that immersive theater is currently enjoying has a lot to do with the time we live in and the cultural systems at play. I see experience-based work as both a response or remedy for our digital lives, but also deeply indebted to and enabled by them. We have so much virtual experience in our daily routines, that I believe larger audiences are not content to sit passively for live events, but rather want to participate. We seek out the tactile, the personal, the one-on-one engagement. But also, I think we are able to navigate these worlds because we understand the role play, the labyrinthine fantasy logic of them due, in part, to our digital experiences. What motivated you to start making productions like this? Were you influenced by video games, or alternate reality games, or other sorts of participatory entertainment experiences? We originally started making site-specific works as a way to connect with a wider public, engage with real-world architecture, and put our art into the public in a more direct way. We wanted to get our work out of the art houses and theaters, to figure out new methods for capturing people's attention, discover new structures for dance and theater, and finding ways to refocus and re-contextualize the kind of art we were making. Immersive theater became the next logical step, allowing us to utilize the robust movement, structure and storytelling tools we discovered working on-site alongside the tools that a closed-world theatrical environment allows in terms of focus and intimacy. Are there people who come who just don't get it? I think a lot of people aren't sure what to expect, but most leave with a sense of real satisfaction even so. It's hard not to get it. It surrounds you and gets into all your senses. Even if you don't understand one bit of the narrative, you still walk away as if from a dream. It permeates you in some way and you are affected by it even if you can't quantify it. I think that's what people respond to the most, and many people contact us to tell us their experiences. They feel haunted by the work, and it opens up so many questions for them, that they continue to ponder it long after they leave. I love that. What can go wrong in a production like this? What do you have to guard against? Because it's so intimate, everything is always new (both a blessing and a curse). Every audience member has the potential to respond in a new way, and each scene can be a real collaboration to some extent. That's exciting, but it also means you have to train differently and be prepared for a wide palette of responses. It also means the structure you are working in must be very clearly defined and solid so your performance is supported. Structure is everything. Do you think immersive, interactive theater will ever take the place of conventional, proscenium-arch theater? Or is it essentially a counterpoint? I think it's a counterpoint. They are both mutually informative, though vastly different. I've always found there's a real exchange between the two and what you can learn from both. Site-specific and immersive theater are not new. They are as old as any other form of theater, but what we are seeing now is more of a saturation of these forms. I think it will continue to grow and evolve as long as artists keep adding new ideas to the conversation. I think a lot of the surge is also audience driven. People are really hungry for this type of theater now. It's waking people up. Then She Fell plays through Sept. 29 at 195 Maujer Street in Brooklyn. Tickets can be purchased here.